While on foot patrol with the 2nd Combat Engineer Battalion, supporting 3/8 Marines, Corporal Joseph Woodke stepped on an improvised explosive device (IED) in Helmand Province, Afghanistan on March 29, 2011. The blast resulted in the loss of both legs and damage to his right ear. 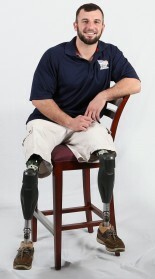 During his year and a half long stay at Walter Reed Medical Center, Cpl Woodke underwent several surgeries for his legs and ear. Now medically retired, Joseph has become an accomplished athlete. He has hand-cycled in seven marathons and plays sled hockey for the Nashville Sled Predators. He would like to use these skills to eventually open his own gym. Joey obtained his business degree in December 2017 and has been helping his father with their farm in Michigan. Receiving a specially adapted custom home, he says, will help him with these goals as it would lift the financial burden. He is also looking forward to the wide open floor plan, which will make it easier for him to get around while in his wheelchair. Having an automatic door will be beneficial when carrying items into the home, too. Originally from Michigan, Joseph just moved to Nashville for a warmer climate and would like to build his home near that area. USAHockey.com, April 12, 2019 Three Marines pushed each other as they recovered and adjusted to a life as double amputees. While rehabilitating at Walter Reed National Military Medical Center, John Curtin, Ben Maenza and Joey Woodke discovered they had similar interests, interests that ultimately led to them becoming teammates on the ice. Read more. Read more.